On Wednesday 21st November, staff and students gathered to recognise the efforts of outstanding people at MSSL. 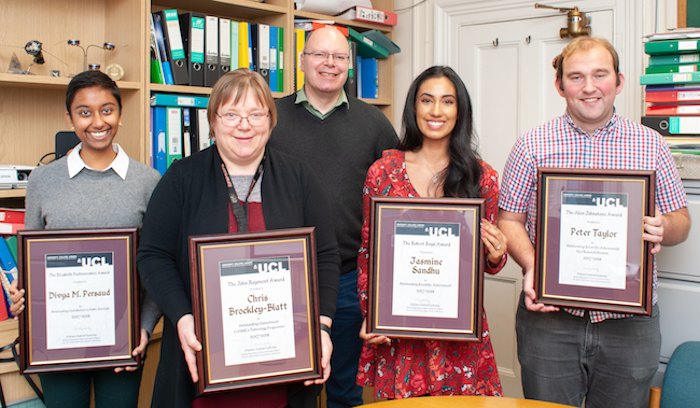 This annual awards ceremony honours the memory of former colleagues and showcases excellence in our science, engineering and outreach programmes. The Robert Boyd Award was presented to Jasmine Sandhu, a post-doctoral researcher in the Space Plasma Physics Group. Jasmine joined MSSL in February 2017 and her work focuses is on how plasma composition and magnetic field topologies respond to solar wind and substorm energy input. She has 10 publications, 5 of which are first author and each of her publications go towards specific aims of understanding the system-level response of the magnetosphere to solar wind and substorm energization. The John Raymont Award was presented to Chris Brockley-Blatt for outstanding dedication to project managing the International SWA consortium – a key mission suite for the Solar Orbiter mission. Chris joined MSSL in 2001 and some of the projects she has worked on include Herschel, Exomars, Solar Orbiter and Euclid. The Elizabeth Puchnarewicz Award was presented to Divya Persaud, a student in the Imaging Group. Divya has been involved in a huge amount of outreach since starting at the lab last year, including attending a Women in Science outreach event at local schools in her first week, organising and running the UCL Mission to Mars day within her first 3 months, organising and running multiple demonstrations at the UCL International Day of Light event, helping with work experience week, developing course content and demonstrating at the Spacelink GetSpace day, participating in various diversity and equality committees and events, presenting to visiting schools and scout groups at the lab, and always taking the time to talk to undergraduate visitors. She is a founder of the SpaceWoC campaign to promote space science for women of colour, and a brilliant communicator of science. The Director’s Award was presented to the SuperNEMO Technical Team for efforts in tackling the challenges encountered while creating the largest structure we ever designed and built at MSSL. SuperNEMO is a modern neutrinoless double beta decay experiment and the MSSL team were responsible for the design, creation and delivery of the tracker modules which have been installed in an underground laboratory at Modan (on border between France and Italy). The technical team comprises Paul Gocher, Tom Hunt, Martin Kemp and Craig Theobald.